Sup is a hyperlocal mobile app that makes it easier to connect with friends who happen to be close by at any given moment. Nearby contacts are shown on a radar so that you can explore your area for pals or the app can be configured to provide notifications when people reach a certain proximity. 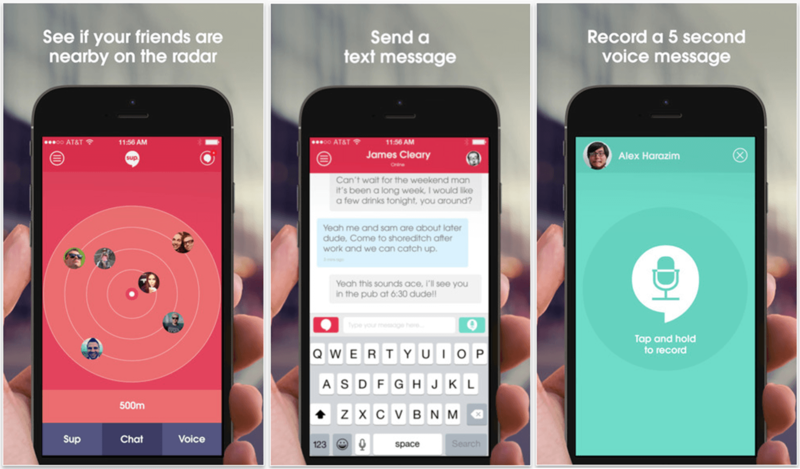 When you discover someone close, you can send them a “Sup” text or record an audio note. The app does a good job avoiding the security & privacy vulnerabilities by only showing general location in terms of “within X meters away” rather than providing pinpoint accuracy. Users can also “go dark” Jack Bauer style by temporarily disabling the location services to drop off the radar. There are a few other entries into the hyperlocal map & chat space, including the quietly launched Google side project Who’s Down which consists of a simple toggle that a user can switch when they are, well, down to hang out. There’s also Connect, which is a similar play to Sup, except they actually display the friends’ locations on a map. Sup is based on London, England and is co-founded by Rich Pleeth, Robin Gadsby and Alan Fayolle. They launched in March of this year and in October raised $1.1 million in seed funding. The product is out of beta and free to download/use though the App Store – Sup is not yet available on Android. I live in a college city in the midwest and when facebook started to show me which friends were near me, I was excited and the application worked very well. I am interested in this because we are always trying to meet up and there is nothing wrong with a spontaneous cup of coffee! Another nice looking application that is a copy of another that was popular a few years ago. Just like you said, it will only be as useful as the number of friends that are actually using it.